Also known as titanium green marble, the offered Spider Green Marble is accessible with natural, polished, antiqued, brushed and various other surface finishing options. This type of marble is used to develop kitchen counter top, table top, stairs and sculptures of customized configurations. We offer this marble in tile and slab forms. Accessible in different size, thickness and dimension options, this type of green marble is noteworthy for unique vein pattern of its surface. Necessary thickness level, good abrasion resistance capacity and long lasting quality are some of the reasons behind its popularity in construction industry. 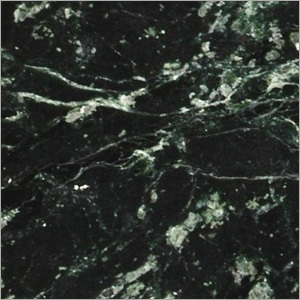 As a growth oriented exporter and supplier, we are offering superior quality Spider Green Marble at reasonable price range. This type of marble is available in standard, premium and commercial quality options.